Request: Penn Mutual, an insurance and investment provider, wished to update their existing intranet advisors' portal which users claimed to be cluttered and confusing. The request included a wholesale update to the information architecture as well as modernization of the user experience of the site itself. Challenges: The structure of the existing site had become disorganized after years of poor content management and a dated content management system. Part way through the pre-production phase, we were told that the content of a sister site also had to be included within the update. 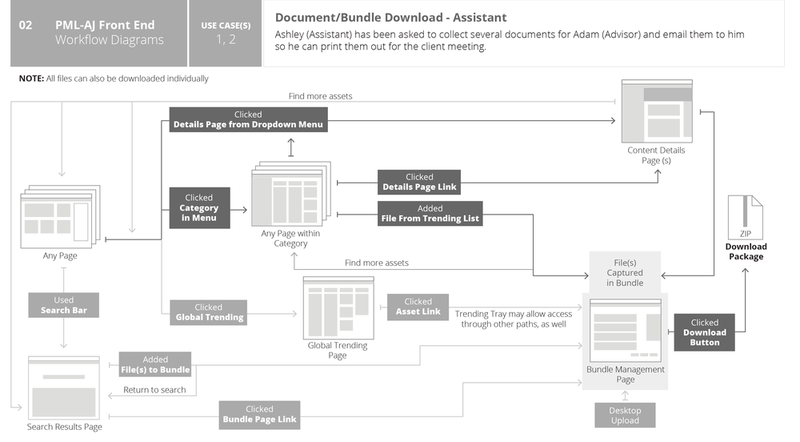 Information Architecture: As the UX strategist, I was tasked with investigating the existing information architecture and proposing a new content hierarchy that would be easier and more intuitive to navigate. This study resulted in an extremely robust but much better organized site map which was updated constantly based on internal and client feedback over several months. Personas: The UX team created a set of personas based on findings from the discovery workshop. Building the personas allowed us to gain a better understanding of the potential users and to begin empathizing with their challenges. I designed and drew the characters and helped to build the content for the presentations. 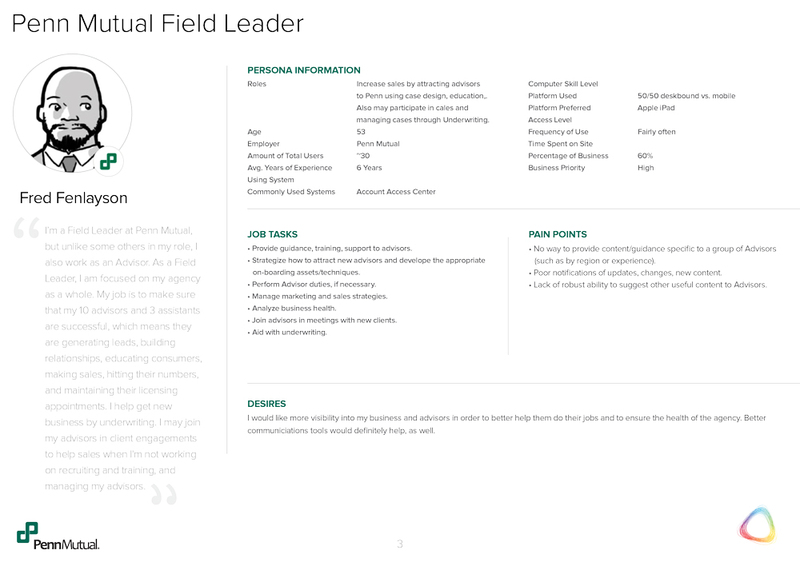 Storyboards: With the personas defined, we created a set of storyboards, based on a common use case, that tied the different personas together to show how they would interact with each other as well as with the new Advisor Journey portal. These helped illustrate our thought processes to the client and allowed us to gain feedback on whether our interpretation of common workflows were accurate. Workflow Diagrams: The storyboards and personas were used to define a set of use cases for various user roles. 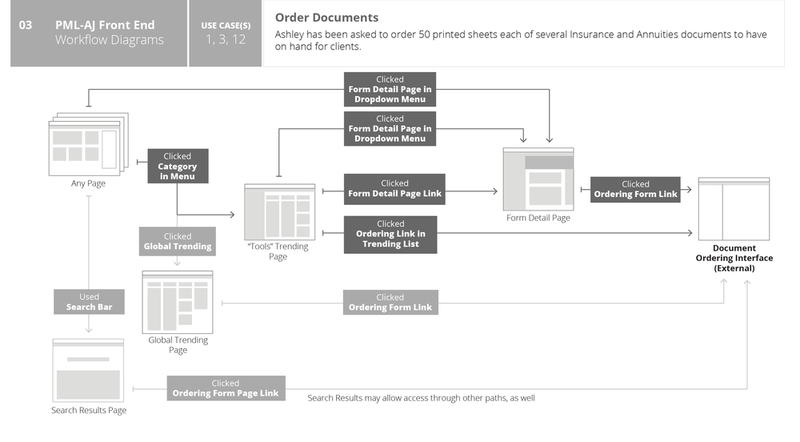 To define these further, I was tasked with creating detailed workflow diagrams based on role and task. This fleshed out more detail the user stories in more detail than the single-arc storyboard. Though we shared them with the client for feedback, the diagrams were largely used by the internal UX and development teams to help track that the requirements for the portal were being met within the interface design. As with the site map, many iterations and feedback cycles were applied to the workflow diagrams to ensure that our approach would meet the needs of the end users. Wireframe to Design: Once the user stories and workflows were defined, I was tasked to begin iterations on wireframes. Multiple sketch versions were iterated and reviewed, leading finally to more hard-lined versions created with Sketch. These also met with multiple internal and external review cycles in order to continue refinement of usability and requirements accuracy. They were then handed off to the UI design team to flesh out mockups with actual assets and content. Though the project is ongoing, the client stakeholders have expressed their satisfaction with the amount of thought, planning, and collaboration that has taken place over the past few months. Through the rapid iterations of preproduction design materials that have been shared with the client, they have felt instrumental in the grueling process of updating such a large scale site map in a way that makes sense to both our team and theirs. Additionally, we have taken into account the structure of the site as content shrinks and grows, focusing a huge amount of time into understanding the site architecture and the constraints required for content managers in order to prevent site sprawl on the scale of the original platform.